Posted on Sun, Aug 9, 2009 : 3:58 p.m.
CHICAGO - It’s rare he gets to go fishing any more with football the dominant factor in Mark Ortmann’s life the past five years at Michigan. But every once in a while, the offensive lineman is able to slip away, grab a fishing pole and head out onto Lake Michigan. When he’s there, he’s competing in salmon tournaments in the town of Wilmette, Ill., a suburb of Chicago where his girlfriend’s grandparents live. Needless to say, being out of fishing practice, the expeditions haven’t really gone well. Ortmann, though, wasn’t discouraged. He looked around, he said, and saw not many other people were catching fish, either. But the ones they did, they smoked and ate - the only times Ortmann eats the fish he catches. His fishing failures, though, are trivial. The 6-foot-7 native of Klein, Texas spent most of last year’s 3-9 season playing injured. So as he mentally went through a disastrous season with his team, he physically persevered throughout an entire year with a bad elbow. “He just put that big old wrap on his arm with a big old pad on and just goes and does it,” Michigan coach Rich Rodriguez said. “But from a strength standpoint, I’m sure he was close to 70 percent and for a guy up front who has to use his strength on every play, that sure is tough on him. Rodriguez said he heard so little from Ortmann about his right elbow last season that he never was truly sure how much he was hurting and how much the injury was affecting his play. Now, though, both Rodriguez and Ortmann say he’s healthy. He’s stronger. And he’s in a position where he’s going to be more of a leader to a more experienced line. “Last year, as rough as it was, was a building year and I see that as helping us,” Ortmann said. “You can see that in the spring game and throughout spring, just the experience that we gained. Plus, he offers versatility. Ortmann has played at both tackle and guard, meaning Michigan’s coaching staff can slide him wherever they feel he fits the best. He feels he fits best at tackle - the place he’s played almost all of his career after playing tight end at Klein High School in Texas at 6-7, 270 pounds. The position title, though, was deceiving. While Klein threw the ball to him at points, it mostly used him as an extra blocker, according to Klein football coach Stan Labay. 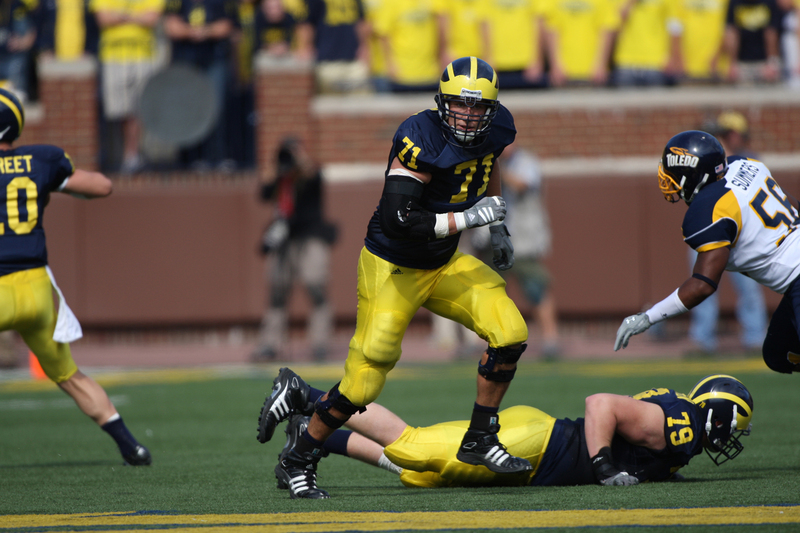 He made the transition throughout his redshirt year at Michigan and for the past two years has been an anchor of sorts for a transitioning offensive line from a traditional offense to a spread one and as an emotional leader, too. That’s when he’s on the field and in the midst of football and that seems to encompass his life in Ann Arbor. He doesn’t have his fishing poles here. And as he said, he doesn’t really have the time. Instead, he’s too busy trying to turn things around at Michigan. Michael Rothstein covers University of Michigan basketball for annarbor.com. He can be reached at (734) 623-2558 or by e-mail at michaelrothstein@annarbor.com. Mon, Aug 10, 2009 : 12:28 p.m.
Mon, Aug 10, 2009 : 12:28 a.m.
Sun, Aug 9, 2009 : 9:24 p.m.
Ortmann should be in great shape for the upcoming season. What impresses me about the above pic is the dedication. You can say what you want about the Barwis fitness program, but in the above pic, even though he was out of the play, #79 felt compelled to drop and do 20 pushups right there on the field. It's a great day to be a Wolverine. I can't wait until Sep.
Sun, Aug 9, 2009 : 6:54 p.m.
With this tremendous, coherent offensive line and all of the speed talent that RR has brought in, I'm thinking that we'll be able to score TWO touchdowns per possession. Sure, a lot of you might think, "Oh there's trashel and all that nonsense again." But just wait - we will be STEAMROLLING chumps! Sun, Aug 9, 2009 : 6:53 p.m. He better be good as the O Line is expected to be middle of the pact in Big Ten. Iowa is supposed to have the best then OSU and Penn State. Mich ranks 5 just above the Spartans. 6 maybe 7 wins depending on line play on both sides of the ball. Sun, Aug 9, 2009 : 4:54 p.m.
Looks like another great Michigan offensive lineman, in the pattern of Jake Long. Good luck, Mark!